Cinabrina or Maculata - That is the question. Such a complicated name situation for a pretty little yellow flower! Canna compacta var. cinabrina was first offered by YuccaDo Nursery. It turned out to be extremely fertile, so the predictable happened - seeds and rhizomes turned up all over eBay. The spelling "cinnabarina" is also common. Now this sweet canna is determined to be Canna indica var. maculata. 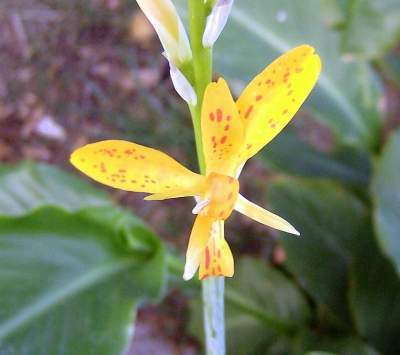 Canna compacta is commonly called Robert Kemp and not the same species as Maculata. Taxonomy aside, Maculata is darling with its wavy leaves and profusion of spotted flowers. The hummingbirds love it, too.